Many people forget about home office decor when they are setting up their workspace, but it is just as important to add a bit of style and pizazz to these rooms as it is anywhere else in the house. If you are anything like me, you are likely to spend a significant portion of your time in this space, especially if you work from home. If that is the case, obviously you want to make your surroundings attractive, functional, and a pleasure to spend time in. The home office setup you decide on can play a large factor in all three of those items. 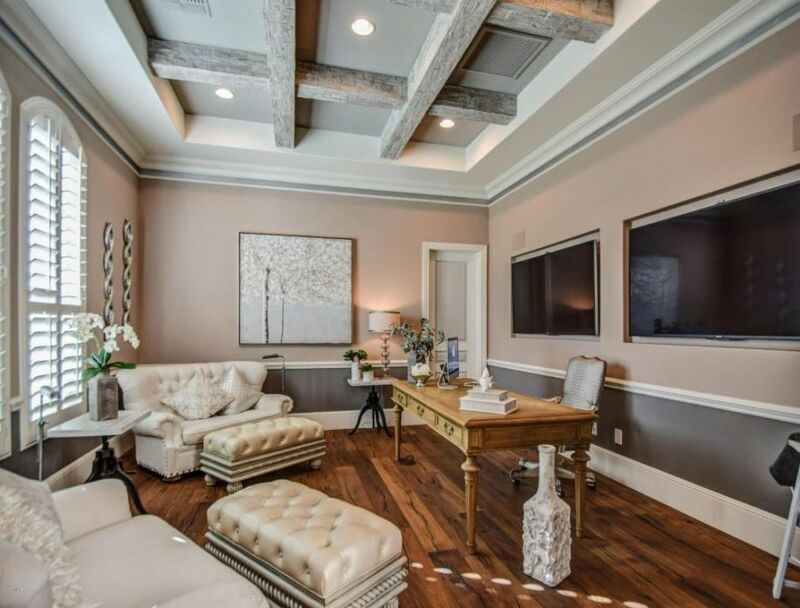 This beautiful space is a project I recently complete for one of our clients that works in a Telehealth job from home. 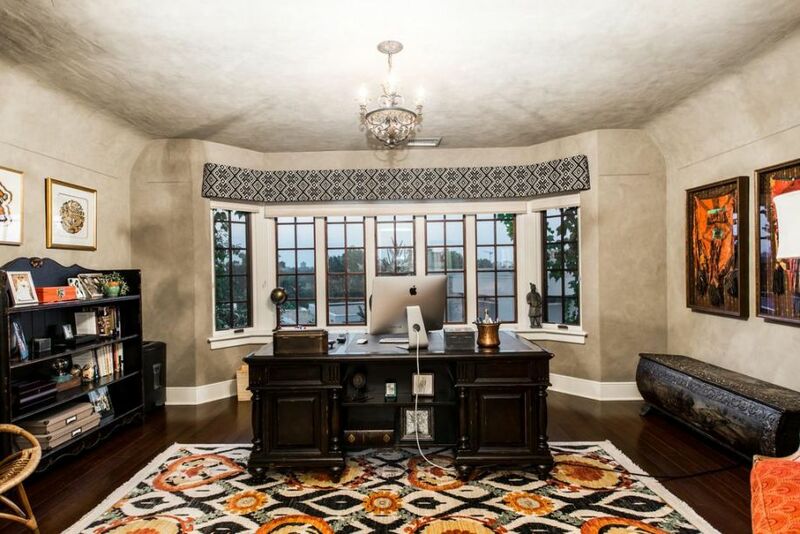 As somebody who works out of my personal residence myself (shown here), I always enjoy helping clients to create a home office design that both inspires and motivates them. There are many things you can do achieve this within your design, from adding personal touches like achievements, trinkets from your travels and favorite artwork, to simple decor decisions like painting the room in your favorite color. It is also important to know that you do not need a huge space to achieve a beautiful and productive look, there are so many fantastic small home office ideas that create just as wonderful a room. If you are struggling with where to begin your design, I always suggest starting with the desk. I have been looking out for home office desk ideas since I decided to convert our formal living room in the front of the house to a more functional space for me. Our family never really spends time that room for its intended use because we have large family room in the back of the house where everybody tends to congregate. Since I switched to a more home based position at my job, I realized I would need a dedicated space to get work done. For this reason, I have been on the hunt for pretty home office furniture that would look nice off of the main area of our home but would still be functional enough for me to get some work done. 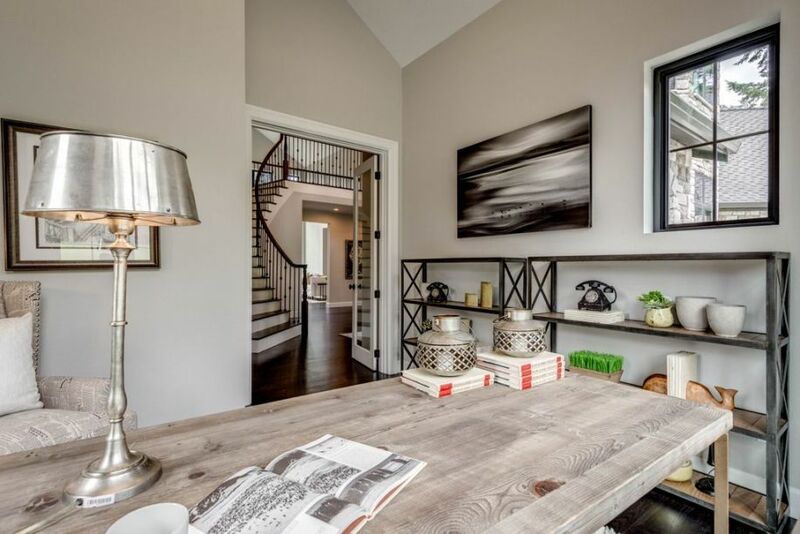 I really liked how these homeowners created a well decorated yet obviously functional area off of the foyer. Office interior design is so revealing of the person that works there everyday because it shows the things that motivate them, that relaxes them, and that they enjoy. I was particularly struck by this design because of the vibrant orange and brown color palette, bold textiles (rug and curtains), and funky decorative accents. I can only imagine what the person that calls this space home is like. I actually think that this room is a great source of home office decor ideas because it brings something a little bit different to the table. I like how the use of artwork, trinkets, and textiles really make the space shine and transform it from a place for work, to a space where you can let your creativity flow. Looking for a modern, well-lit design that satisfies your office design ideas of your contemporary stay-at-home worker? This is it. The bright, clean, wooden setting is consistent with that of top fabricators of professional work space. Indeed, these office decor ideas create a motivating environment that affords “work-from-home” comfort and ease, but also exudes the sharp confidence of a powerful city executive, something sure to impress any client. 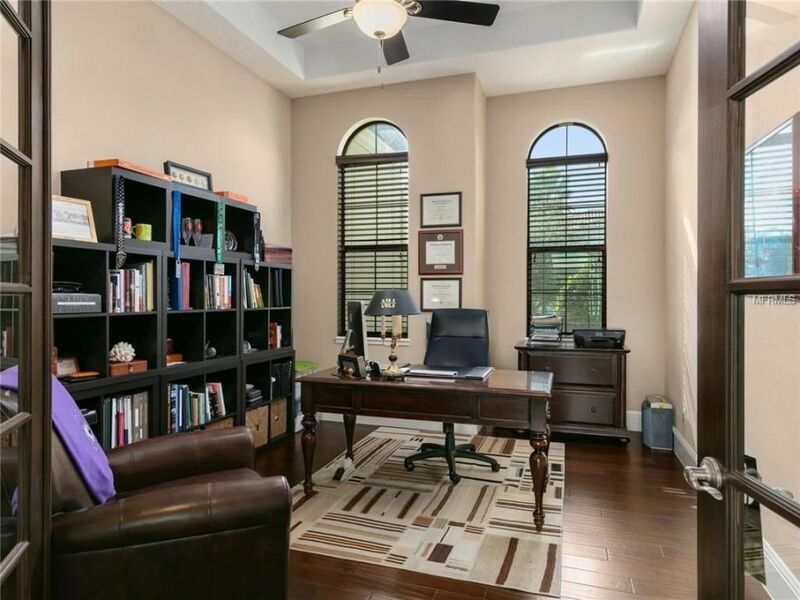 Complete with tasteful home office ideas with artwork and a spacious wall behind the desk that focuses visitors on your academic accomplishments, the space has plenty of room for simple but important comforts such as coffee service, minibar and microwave. This is my absolute favorite office design of all time and I want to recreate it in my house immediately. I think that this space is perfect, from the gorgeous panelling on the walls and ceiling, to the relaxing blue and white color palette, and everything in between. 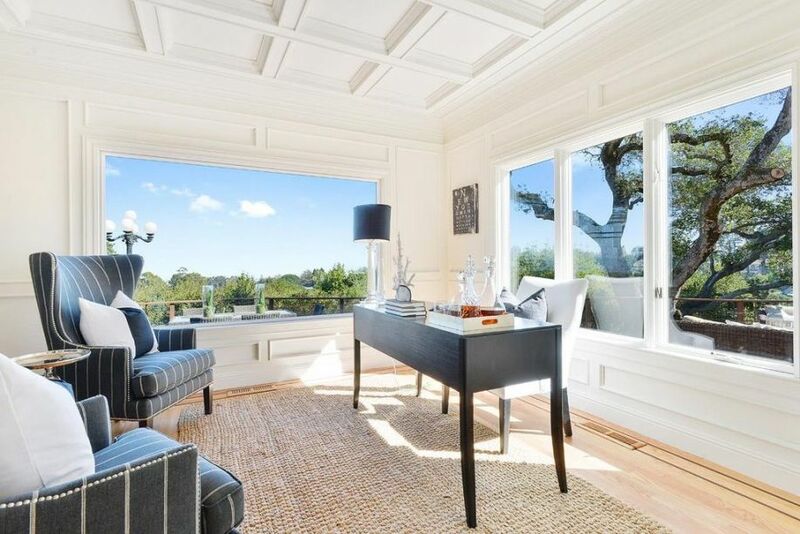 The interior decorator selected the perfect office furniture to fit within the narrow floor plan of the room because it does not make the space feel crowded and is "see-through" enough to reveal the gorgeous views out of the windows. Likewise, the dusty navy blue armchairs and coordinating lamp, really compliment the gorgeous blue skies outside. Perhaps my favorite accent piece in the room is the classic seagrass rug on the floor.